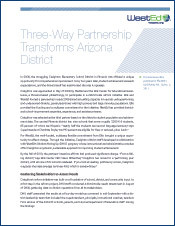 In 2008, the struggling Creighton Elementary School District in Phoenix was offered a unique opportunity for comprehensive improvement. Now, two years later, student achievement exceeds expectations, and the district itself has transformed the way it operates. Creighton was approached in May of 2008 by WestEd and the Ellis Center for Educational Excellence, a Phoenix-based philanthropy, to participate in a districtwide reform initiative. For WestEd, the well-funded, multiyear, flexible commitment from Ellis brought a unique opportunity to effect change. Through the initiative, Creighton district staff developed a collaboration with WestEd’s DistrictsMovingUp (DMU), whose instructional and administrative coaches offer Creighton a systemic, sustainable approach to improving student achievement. By the fall of 2010, the partners’ intensive efforts had produced significant change. Creighton’s reform initiative was built on a foundation of school, district, and community input. As a first step in the reform project, DMU staff conducted a districtwide needs assessment in August of 2008. School districts are at the crux of our American system of education. View this webinar to discover how 18 California school districts have developed and implemented improvement plans leading to increased student achievement. English Language and Literacy Acceleration (ELLA)ELLA is a research-based professional development program that improves academic literacy instruction for pre-K through 8th grade students. DistrictsMovingUpOur DistrictsMovingUp team provides customized, comprehensive research-based solutions that meet the unique needs of your school district.